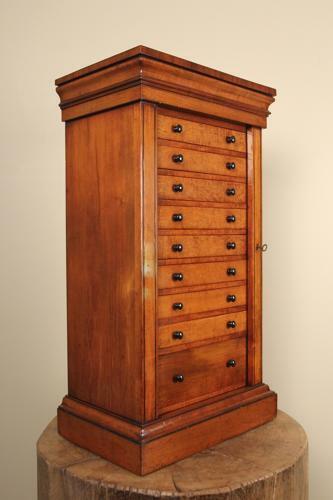 A fine, high quality Mahgoany Collectors Cabinet in the form of a Miniature Wellington Chest. The beatiful cabinet having an arrangment of 9 Mahogany lined drawers, all retaining the original Ebony knob handles, lock and key. With a moulded top and rased on a plinth base, superb colour and original finish throughout.